← A Dr. Sears Seminar… the Attachment Parent Guru! A few years ago, I read in the news about an ice cream shop in the UK that was selling ice cream made from human breastmilk for something like $25 a pop. At the time, Margo had just been born and I had already been breastfeeding already for several months. So, the idea of a human consuming another human’s breastmilk didn’t seem too much of a crazy notion to me… although, I could understand some people that would think otherwise! Well, I haven’t had a breastfeeding break since then and the old girls have been working double time lately. A few weeks ago, a cry went out on a parenting facebook page that I belong to, ‘Local mum in hospital, needs donated milk‘. Donating breastmilk had been something on my mind for a while. I had read an amazing story, from a local mum, about the journey of having her son premature, at 25 weeks, and how she relied on the kind donations of human breastmilk from people in the community. The milk can come either from a milk bank (for $80 a litre, the money goes to ensuring the milk’s purity), or from private donors (done discretely, the hospitals don’t like it). So, even before reading the facebook post, I had already contacted a local breastmilk ‘bank’ to see if I could donate milk. To my surprise, the milk bank had a waiting list of donors! They had that many woman volunteering to donate milk! Wow! I had never even heard about donating milk before that and here I was not even cool enough to make the waiting list! Anyway, so I saw the post for the ‘milk needed‘ and I decided to see how much I could get if I pumped. A few of the other mothers in the area coordinated to ‘leap frog‘ the milk to where the woman was in the hospital (about an hour drive from me). It was seriously funny, like milk drug dealing, we coordinated pick-up times and drop off locations and how many ounces we had, etc. I was very proud of myself. 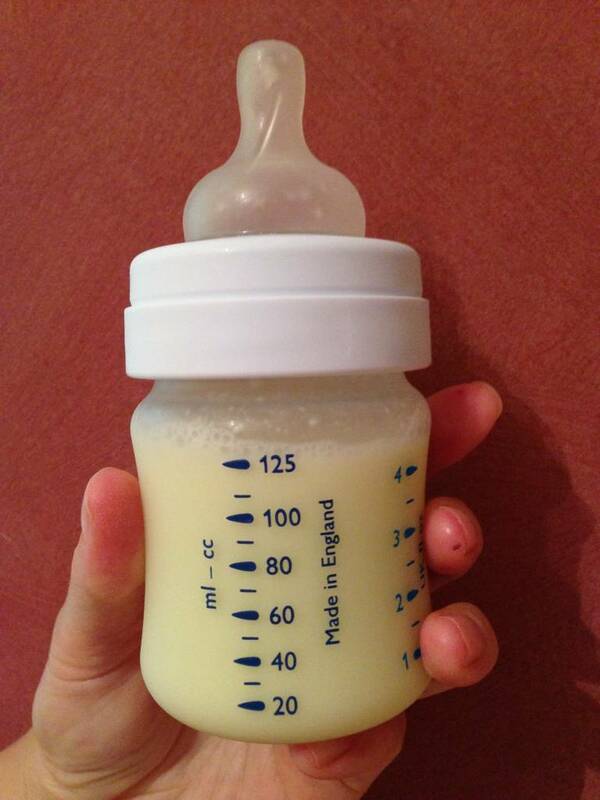 In 12 hours, I managed to pump 330ml (11oz) extra, that’s extra, on top of feeding two kids! I had no idea I was making that much milk! All I had to do was drink a little extra water. I haven’t pumped a real bottle since Margo was really tiny,,, in years, and here I pumped three! I even had to dig some of the breast pump pieces out of Margo’s toy basket! No wonder Goldie is so fat! I had no idea how much she was getting with her super short 5 minutes feeds! Amazing! So, now comes to the ethics of donating breast milk. In other words… many people are not 100% comfortable with giving their baby another woman’s breastmilk. I can totally understand! It can seem much more ‘normal’ to feed a baby formula that is derived from cows milk and comes in a package. But… some woman believe that baby cows should drink cow milk… and baby humans should be drinking human milk. Cows have four parts to their stomachs and humans only have one, etc. Cows milk has to be heavily processed to make it easier to digest, before it can be sold as formula for babies. Many woman may not even know that feeding a baby donated breastmilk is even an option! I had certainly never heard about it. Obviously, the donated breast milk can be used whenever using formula may be considered. if a baby is born prematurely, and the mother is not producing enough milk. if a mother has to undergo surgery or will be on a certain medication. Woot woot!! I accepted donor milk for my baby when I had low supply. It was a leap of faith but so worth it. Babies love breast milk! That’s awesome! Was it from a private donor? Yes it was- a mutual friend hooked us up. She had donated to six or seven other babies as well, which I think is amazing, knowing the kind of effort it takes to pump. I am so grateful to her, and to the other two women who also donated to me. It’s a great thing.